The wood and bamboo vinegar extracts are condensed 5 times until both become powder. 4.0g of the powder are then placed in the BodyPure® foot pad (conventionally 3.2g are used). Other products contain starch powder in order to maximize profit at the expense of quality. If a tincture of iodine is added to the foot pads (in order to test the density of wood vinegar), purity can be determined by how clear the solution remains. 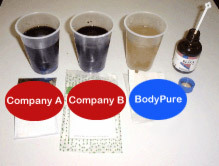 As can be seen,the products from company A and B will change color, while BodyPure® does not.